Turns out Komodo dragons aren’t all that unique afterall. A new study on Komodo dragon phylogeny has found that the mighty ora was, in fact, one of many. Since this is in PLoS ONE, that means it is freely available. Hooray! The authors looked at the skeleton of Varanus komodoensis, V.salvator, and V.priscus (Megalania).? By carefully examining the various bones of the skeleton, the authors were able to determine the taxonomic placement of various large Varanus fossils found in Australia, Indonesia, and Asia. In the end their results showed that contrary to popular belief, Komodo dragons are not examples of island giantism, but rather were already large migrants from Australia during periods of low sea level. So much for the pygmy elephants scenario. Along with finding strong support for the close association of V.komodoensis with V.priscus, the authors also showed that Australia was actually home to many large varanids during the Pliocene/Pleistocene. So while Meglania was certainly the biggest, it wasn’t unique. The authors showed that giantism evolved at least twice in varanids. Once in Asia, and again in Australia. The paper also gives support to the statements of Molnar (2004), that the old belief that Komodo dragons (and reptiles in general) only got big because they were isolated from mammalian competitors, is completely false.? The authors point out that both data for the ora, and for another large (though now extinct) varanid – V.silvalensis – show that they existed contemporaneously with large mammalian competitors (hyaenas and tigers). Not only that, but it was on the mainland that they appear to have gotten large in the first place. So not only could large lizards hold their own against “sophisticated” mammalian predators, but they even appeared able to grow to competitive size despite the pressures. Finally, the authors also discovered yet another large varanid that lived in Australia before making its way towards Timor. 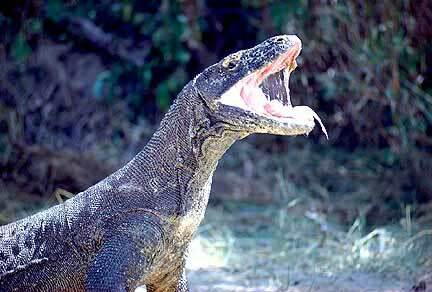 This one was intermediate in size between Komodo dragons and Megalania. So it would appear that Australia was not unique in having reptilian megafauna during the Pliocene/Pleistocene.? It seems? that much of Australasia was rife with large, voracious varanids. New paper dispells Komodo myth. Also Megalania may have been the world’s largest venomous animal. Turns out that plesiosaurs gave birth to live young. It’s about damned time.